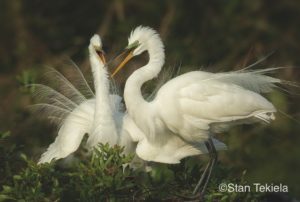 Stan Tekiela, author of Cranes, Herons & Egrets, shares with us his love for these majestic birds. Cranes, herons, and egrets are long-legged, elegant birds that are amazing to watch. Seeing them near our homes or while out for a walk or bike ride greatly enhances our outdoor experience. Because they tend to be tall, large, colorful, and fairly obvious, we take much joy in being able to observe and identify them easily. Cranes are the royalty of the bird world. No other birds represent such beauty, stateliness, and grace. Since the dawn of time and across every nation on this planet, cranes have drawn the admiration of people. From their soul-touching call to their magnificent flight, Sandhill and Whooping Cranes adorn North America with their presence. If the Sandhill Crane is the main event, then the Whooping Crane has to be the highlight! The tallest bird in North America, this majestic creature was nearly driven to extinction. Through many concerted efforts, it was reintroduced, and now several populations occur in the United States and Canada. These small migratory populations have grown over the years and now include up to about 250 individuals. 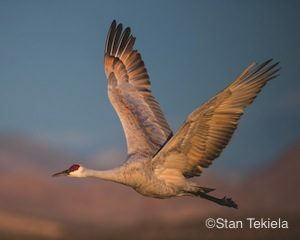 Sandhill Cranes are quite possibly one of the oldest known bird species. Fossilized wing bones found in Nebraska date back 10 million years, and scientists think these finds belong to a remarkably old crane species that may be closely related to our modern Sandhill Cranes. Perhaps even more amazing are Florida’s crane fossils, which date back 2.5 million years. These are clearly the same Sandhill species of today. It’s exciting to think about how long these magnificent cranes have been flying over North America! Herons and egrets are not only elegant and beautiful, but they are also some of the easiest of all birds to see and identify. In many parts of the United States they can be fairly common. While they may be familiar birds, they are nonetheless stunning and a pleasure to behold. Herons and egrets are a diverse group of handsome wading birds. From the pure white Great Egret to the diminutive Green Heron, they all share the propensity for fresh fish. Chances are, you have seen some of these marvelous birds stalking ponds, lakes, rivers, or backwaters in search of their next meal. Herons and egrets have had an unfortunate history with people. Due to fashion trends from the late 1800s to the early 1900s, hunters killed many birds just for their feathers, mostly to adorn women’s hats. Between the 1870s and mid-1920s, tens of millions of herons and egrets were killed to meet the demand for their ornate breeding plumage. Market hunters targeted heronries, where often hundreds of adults nested with their young, and killed all the parents. The babies were left to fend for themselves, usually with disastrous results. 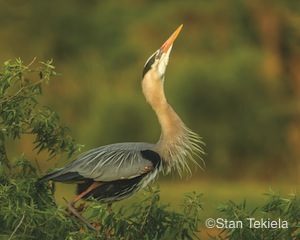 Many of the herons and egrets we appreciate today, such as Tricolored Herons, Great Egrets, and Reddish Egrets, were almost hunted into extinction. This outraged a lot of people, and U.S. and Canadian conservation groups started forming. When heronry slaughtering became public knowledge, people demanded legal protection for the birds. Several federal laws were passed, and many more laws were enacted between 1900 and the 1930s. Around the same time, fashions changed and the demand for feathers faded away. Many of these laws are still in effect today and protect non-game species. This is why it’s illegal to own many types of non-game species feathers. Preventing new demands for feathers, these laws are often strictly enforced. The power of nature reaches through these beautiful birds deep into our souls and touches a place that needs to be soothed. I am thrilled every time I see, hear, or photograph a crane, heron, or egret, and I feel fortunate to be able to study and appreciate these incredible birds! I sincerely hope that you appreciate them too.